This service highlight was originally posted by the California Farm to School Network and was written by FoodCorps Service Member Michelle Pinter-Petrillo, who is currently serving with Oakland Unified School District as a garden educator. Read on to learn how Michelle juggles teaching classrooms and mentoring high school youth. Watching a 2nd grader’s first bite of lettuce straight from the garden is a rewarding experience, but watching Oakland high school students develop and lead a lettuce tasting activity for Oakland elementary students was a service defining ‘a-ha’ moment for me. As a FoodCorps Service Member serving with Oakland Unified School District (OUSD), I came to Oakland with the intention of teaching elementary level gardening. However, within the first month of my service, I was introduced to the MetWest High School internship program. As a partnership between OUSD and the Big Picture Learning Network, MetWest utilizes internships and hands-on learning to cultivate students who “will have the skills, habits, knowledge and networks to overcome obstacles to their success, access four-year colleges, engage in fulfilling work and contribute positively to our world.” Students spend two days per week working with a mentor at an internship in their community. Initially in my mind, mentoring a high school intern or two meant less stress managing thirty elementary students in an outdoor classroom. Needless to say: I was in. However, after working with two MetWest interns for a few weeks, I started to realize that this program would help to define my service experience. As Oakland students not far removed from elementary school, my interns Katie and Jose, connect with our students on a deeper, more genuine level than I am capable of. I am the teacher who grew up across the country, but Katie and Jose are role models from the community. Every day Katie and Jose learn more about food, health and gardening and every day they find creative ways to pass on that knowledge to our students. “I am really interested in learning and sharing what is really in the food that we eat,” said Katie, MetWest senior. “Mostly, I just really like having positive, fun experiences with the students,” said Jose, MetWest sophomore. A serious challenge of a one year service program lies in program sustainability. 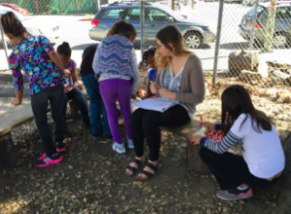 However, in Oakland and in scenarios like the MetWest internship program, it isn’t hard to imagine a future where high school students are mentoring elementary students in the garden and exposing them to hands-on health and science education. Oakland Garden Supervisor, Grey Kolevzon plans to create a youth leadership group to maintain school gardens over the summer, a time when most gardens would dry out and die. While most garden education programs exist in elementary schools, Oakland has begun to connect the dots between elementary students and high school leaders. I hope to continue to help connect those dots through mentoring Katie and Jose along their journey to learn more about gardening and becoming stronger leaders. 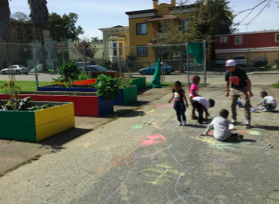 I look forward to future ‘ah-ha’ moments where all Oakland schools have gardens and they are a canvas for outdoor learning, leadership development and community.